Move over New York, California and Florida because Texas has become a strong incubator for alternative small business finance. 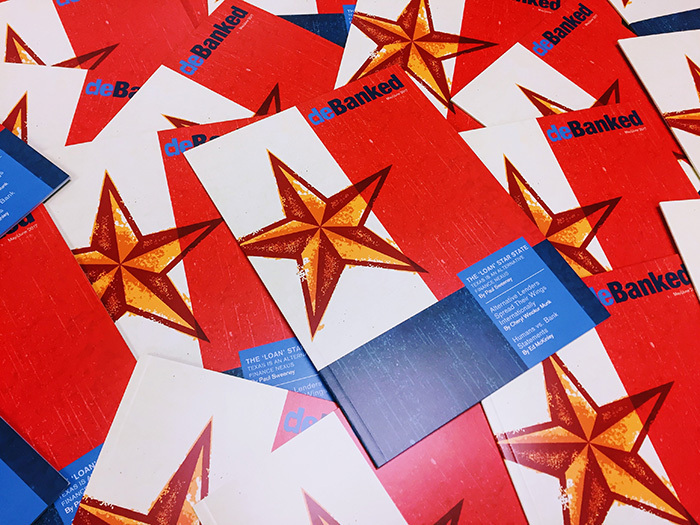 In this newest deBanked magazine issue, we went to Dallas-Fort Worth, Austin and Corpus Christi to find out how and why non-bank financing products are flourishing. We were impressed by what we found and inspired just enough to dub Texas The ‘Loan‘ Star State. And we went bigger than Texas (if that can be believed) by exploring how alternative lenders are spreading their wings beyond the states into other countries like the UK, Australia and Canada. But does it make sense to go abroad before you’ve cornered the market domestically? Industry captains share their thoughts. There’s more of course, like how new tweaks to automated processes are actually making manual underwriting exercises easier. That itself has re-opened a debate that won’t seem to go away, humans vs computers in underwriting. In 2017, the humans aren’t out of the game yet and some think they never will be, but there are new tools available to increase speed and efficiency. There’s legal decisions you’ll want to read and details about a new small business lending regulator you’ll want to know about. It’s all in the May/June 2017 issue that subscribers will be receiving in the mail soon and if you’re not subscribed, you should sign up FREE right now!